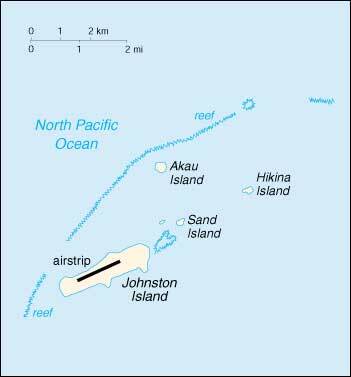 Johnston Atoll, atoll, 2.8 sq mi (7.25 sq km), central Pacific, c.700 nautical mi (1,300 km) SW of Honolulu, central Pacific, an uninc. Territory of the United States. It consists of four islands and reefs. The largest island, Johnston Island, c.3,000 ft (910 m) long and c.600 ft (180 m) wide, has been significantly expanded with dredged fill. During the two decades of the 1950s and the 1960s, the United States Air Force conducted a dozen nuclear-test launchings. Two of these missiles exploded directly over the runway on Johnston Island. Since then, the United States Government has spent four decades gathering the 60,000 cubic yards of radioactive contaminants that the aborted tests sprayed over Johnston Island. Chemical weapons (Agent Orange and other chemicals) have been stored on Johnston Island since 1971. The weapons stored at Johnston Island include more than 400,000 rockets, projectiles, mines, mortars, and ton containers, containing both nerve and mustard agents. The chemical munitions stockpile stored at Johnston Atoll originated from four locations. The Army leased 41 acres in 1971 to store chemical weapons formerly held in Okinawa, which were transferred to the atoll from Okinawa during Operation Red Hat in 1971. In 1972, the Air Force moved Agent Orange stocks to Johnston Atoll [these stocks were destroyed in 1977]. 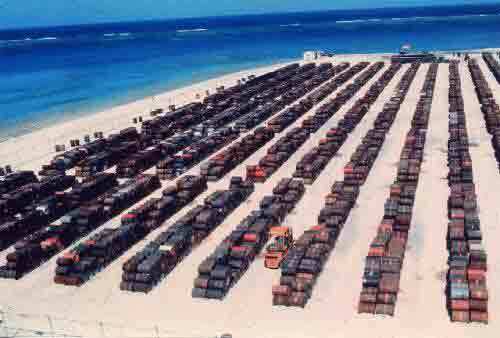 In November 1990, chemical weapon stocks from the Federal Republic of Germany were transferred to Johnston Atoll for destruction in Operation Steel Box. In 1991, range-recovered chemical munitions were brought from the Solomon Islands. Before destruction operations began in 1990, JACADS stored approximately 6.6% of the total US stockpile. In 1981, the Army began planning for the Johnston Atoll Chemical Agent Disposal System (JACADS). Construction began in 1986. It is the world's first full-scale facility built to destroy chemical weapons. The design is based on technologies used for years by the Army and industry. Following completion of construction and facility characterization, JACADS began operational verification testing (OVT) in June 1990. From 1990 until 1993, the Army conducted four planned periods of Operational Verification Testing (OVT), required by Public Law 100-456. OVT was completed in March 1993, having demonstrated that the reverse assembly incineration technology was safe and that JACADS operations met all environmental parameters. The OVT process enabled the Army to gain critical insight into the factors that establish a safe and effective rate of destruction for all munitions and agent types. Only after this critical testing period did the Army proceed with full-scale disposal operations at JACADS. Transition to full-scale operations started in May 1993. The facility actually did not begin full-scale operations until August 1993. 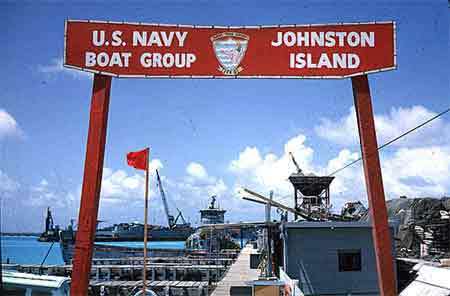 In April 2001 the United States Army Chemical Pacific closes and the clean-up of Johnston Island began. It is my felling that anyone transporting or working around or on these islands should have no problem filing VA claims for AO caused problems. The above info is evidence to the presence of Agent Orange. The United States Fish and Wildlife Service is scheduled to gain oversight of the island as a wildlife refuge. It is not normal practice for a wildlife refuge to be established over a plutonium landfill and there is still considerable concern that the contaminants absorbed by fish could carry the threat elsewhere.